Anam Cara Creations is the art-enterprise program at the North Florida School of Special Education. We facilitate opportunities for artists with intellectual and developmental differences to develop their artistic perspectives and create work that is celebrated and made available for purchase. Art is an equalizer, a platform for communicating that leads to self-empowerment and strong communities. Anam Cara is the Gaelic word for soul friend, each of the artists we work with has an important role in our world. The joy of Anam Cara is working together to discover each other’s strengths and our commonalities. The Anam Cara Creations studio in Jacksonville, Florida is open two days a week with two art teachers supporting a handful of artists. Jill Morrow, director of Anam Cara Creations has been developing this program for the past four years. 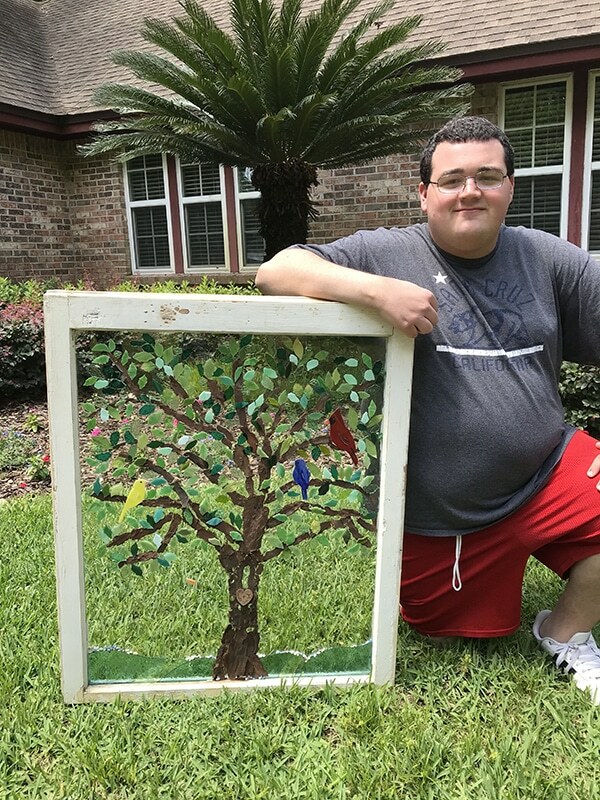 Johnny Piselli was one of the first artists to work in this enterprise, he continues to work every week on intricate mosaic glass windows that range in subject from Evergreen Trees to Beach Scenes. Mosaic windows can be custom ordered, Johnny designs the image and cuts colored glass to fulfill his vision for the piece. Ben Kolster uses paint and paper to make detailed images of ocean life. Another artist, Braxton Beatty, uses smaller pieces of glass with beads to design hanging angels with ceramic hearts stamped with words like “hope” and “joy.” Each angel carries Braxton’s intentionality and care along with a quote on the back relating to its theme. Other artists at Anam Cara Creations are developing sculptures of characters they use to tell elaborate stories, or paint images of wild animals. Every artist has a purpose, a story to tell, by giving them a chance to create we are able to listen and honor them. Every Friday art teachers at North Florida School of Special Education work with students in the Transition program to make Anam Cara Creations products like the ceramic hearts for angels or drawings for greeting cards. The newest product students are creating are Gameday Bags, cross-body and wristlet purses that fit the standard stadium size. Each student receives a cut piece of canvas that they paint independently using brushes, stamps, forks, sponges, straws, and other unique painting tools. Bags are sewn by volunteers and black leather straps are added, students sign their bag as the final touch. Gameday Bags are available in Jacksonville Jaguar, UF Gator, and FSU Seminole color pallets. These purses are unique because each one is a hand-painted piece of art. Students begin their art education in the earliest elementary classes at the North Florida School of Special Education where they focus on fine motor skills and making choices for self-expression through the elements of art. As students grow in perspective and skill they develop their abilities to use art as a form of communication. Throughout a school year students experiment with drawing, painting, collage, ceramics, sculpture, and other forms of design. Teachers identify and support every person’s strengths to open a path towards becoming an Anam Cara artist when they are older. Together we will continue to grow in becoming the best versions of ourselves.